Begin your planning of a circus Party with our Personalized circus invitations. Include in your invitation a circus ticket to be admitted to the party. Additionally request guests come in circus costume. Greet your guests with one of our circus party entrances, Create a circus atmosphere with our selection of circus theme prop decorations, photo stand ins and hanging decorations. Entertain your guests at your circus theme tableware settings. 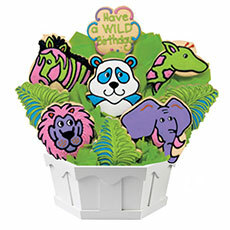 Last but not least, guests will always appreciate our circus party favors. Select from our Circus theme invitations asking guests to your special occasion whether a birthday or any other event. There is a space reserved for your Circus party's information as occasion, date, time, address and R.S.V.P. Add a little excitement and guests participation with a request that your guests come in circus theme costume and to expect a contest for the best circus character. Greet your guests to the circus with our replica circus tent entrances. Complete the excitement of your guests experience with our Circus theme tableware. Many circus theme tableware kits have tableware as well as balloons and banner. So, choose the circus theme tableware that meets your needs and budget. Your guests will feel part of the circus experience if when you send out our invitations you make a request that they come in circus costume. Have a contest for the best costume. Create a realistic atmosphere for your Circus Party with our Circus Standees and Prop decorations as circus tents, Concession Stand, Ticket Booth, Circus Poster Standee, Clown Car and elephant standee and many others. Guests will enjoy a special photo op in our circus theme photo ops and circus stand ins to remember a grand circus event. Lift the spirit of your guests with a balloon as a favor or circus theme balloons are excellent decorations at Activities and as table centerpieces. Send a ticket with the Circus theme Invitations to your event as a ticket for their admission or a ticket for prizes.